Only when we LOVE our veterans will we care for them enough to take care of them the way they need… and deserve! I first began writing The Triumph Book: HEROES to increase patriotism; because who loves our country more than those willing do die for it? But as I interviewed the veterans, I found out I had been an ignorant civilian, not knowing the battles our HEROES face when they return from war. In the process of writing these stories, I became aware of their physical challenges, such as double amputation, homelessness and unemployment, as well as the unseen wounds causing PTSD which leads to broken families and even suicide. With this knowledge, in 2010 I decided to start a campaign called Love Your Veterans in order to raise awareness, appreciation and support for our real heroes. Only when we LOVE our veterans will we care for them enough to take care of them the way they need… and deserve! We need to do so much more than shake hands and say “Thank you” when we see a veteran. Too often, people feel that is the extent of their obligation, as they do little else on behalf of those who have made everything in their lives possible. When I began writing HEROES, the veteran suicide rate was 18 a day. Now it is 22 and climbing. The evidence is clear, we aren’t doing even close to enough. 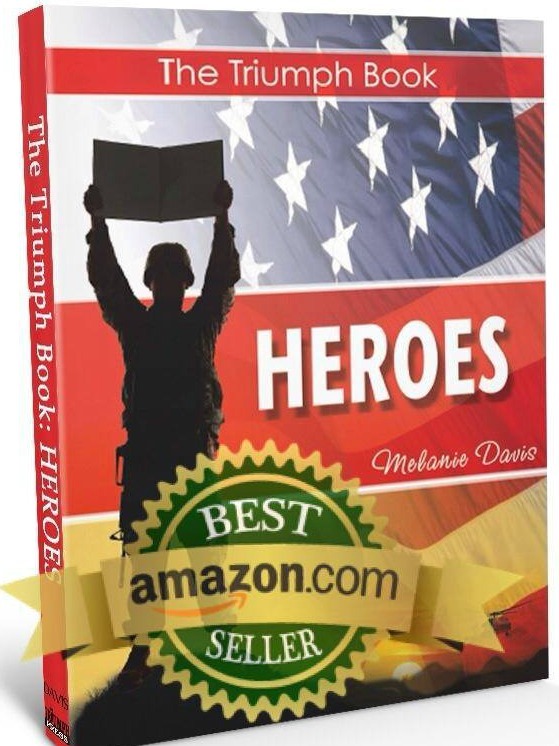 Through the stories featured in The Triumph Book: HEROES, we come to know our veterans much better. By reading their narratives, we understand the incredible difficulties they have faced and learn the reasons why they are willing to die in that service, which has everything to do with loving our country. Regardless of the political debates about whether or not we belonged in the wars we have fought; the hearts and minds of our military service men and women are always focused on protecting our country and the love they have for it. No political argument can change the fact that these people volunteered knowing they might give their lives in the process, with the sole intent of protecting you and me. For years, I believed I was “informed” about the challenges of our veterans and have taken a proactive stand as an advocate for them. But in June of 2017, I met Rick Pritchard, a retired USMC Scout Sniper who had spent years serving inmates inside Texas penitentiaries, and discovered I had no idea there were FORGOTTEN VETERANS! Since learning about the high incarceration rate of our heroes and knowing how completely hidden they have been from society, I have put all of my efforts into serving the Forgotten Veterans and hope to use the Love Your Veterans campaign to assist their condition as well as bring awareness to the other challenges highlighted. I am currently working directly with incarcerated veterans as I conduct peer-to-peer mentoring groups going through The Triumph Program: Armatus Edition and have plans to publish the next in The Triumph Book Series, which will be titled FORGOTTEN HEROES. This book will be a collection of the stories written by the heroes who are living behind the razor wire… those who have sacrificed their freedom to protect ours.